HamiltonJet reports that four HT900 waterjets were selected by Incat Crowther’s latest project, a first-of-type 70m Catamaran Fast Crew Boat for operations in the Caspian Sea oil industry in Azerbaijan. When completed later this year, the vessel reportedly will be the world’s largest high speed crew boat. The new 70m, DP2 class vessel class will feature four control stations, each using Hamilton Jet’s MECS control system integrating with a DNV DYNPOS-AUTR dynamic positioning system. Powered by four 2880kW MTU engines each turning 900mm diameter waterjets, expected top speed is 36 knots with an efficient service speed of 30 knots at full load and 90% MCR. The vessel will be capable of carrying 150 passengers and 14 crew, along with 200 tons of deck cargo, in up to 40 knot wind and seas of 3m significant wave height. 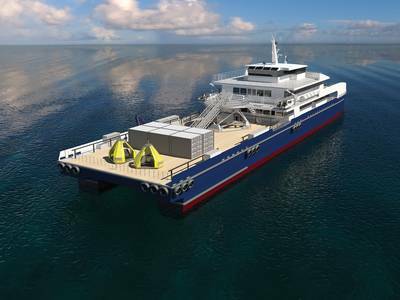 The vessel is under construction at the Incat Tasmania shipyard, with the design by Incat Crowther and production engineering by Revolution Design. In designing this new 70m vessel class, Incat Crowther drew on its previous experience with the SEACOR CrewZer class of fast catamaran crewboats, with the fourth of these recently launched in the U.S. These vessels use HamiltonJet waterjet propulsion (quad HM811s). Prior to this vessel, the largest vessel HamiltonJet waterjets were used in was the 68.5m Gulf Craft-built crew boat Ms Netty. Designed by Incat Crowther, it uses quad HT900 waterjets and has a top speed of 32 knots. Will Hydrogen Signal a Greater Use of Renewables?